How much do we really know about all those human and ape fossils displayed in museums and textbooks? 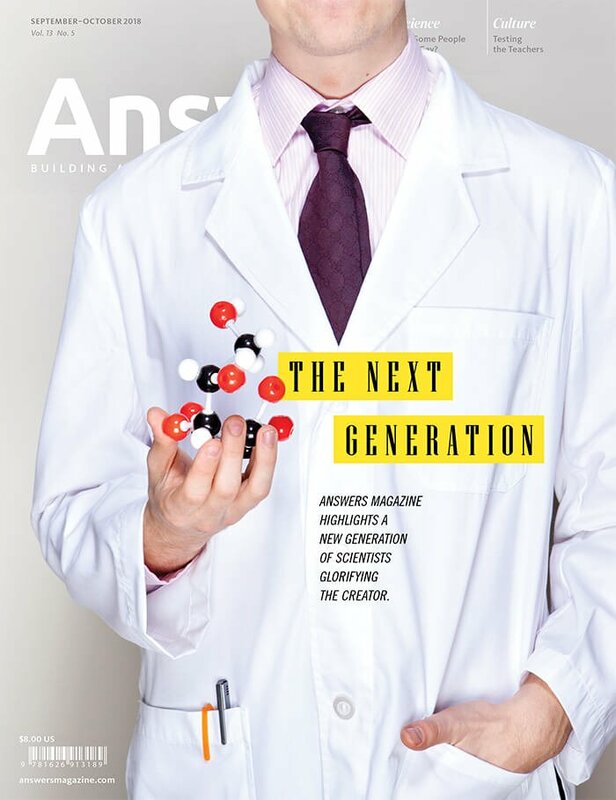 Glossy charts declare their dates and stories with journalistic certainty, but the dating methods aren’t as rock-solid as most people assume. Are you one of those people who have the travel bug, always looking for some new destination to tick off the bucket list? Our ancestors weren’t that way. After the flood, God commanded them to spread over the new world, but they refused to travel. Instead, they congregated at Babel and started to build a tower to make a name for themselves (Genesis 11:4). That rebellion set the stage for one of the most fascinating chapters in human history. From humble beginnings, their prideful disobedience led to God’s judgment, forcing them to disperse and eventually colonize every habitable corner of the planet. The gritty story of their migration, endurance, and conflict fascinates archaeologists and historians. But to piece together the story, we have only a few bones, stone tools, and other artifacts left behind. Two different explanations of the evidence have emerged. One speaks of slow movement and gradual migrations over thousands of generations. The other, which starts with God’s historical record, says the Lord divided human languages at Babel—just over 4,000 years ago—and all human migrations and cultures have occurred since that time. How do we fit these few scattered artifacts and bones into a coherent history? Somehow, we need to work out the age of each find so it can be put in the correct place within the biblical framework of human history. Dating them correctly is critical. Secular scientists have several dating methods at their disposal, which they claim support their views. Does that mean the Bible is wrong? Does it mean their methods are wrong? The problem is not with the Bible or the data that scientists gather, but with their assumptions about the past. Secular investigators start with the assumption that humans evolved from a common ancestor with the apes and then dispersed across the globe over millions of years. Consequently, they have interpreted the evidence accordingly. The fossils don’t actually give us dates, and they can be interpreted in more than one way. How do these methods really work? 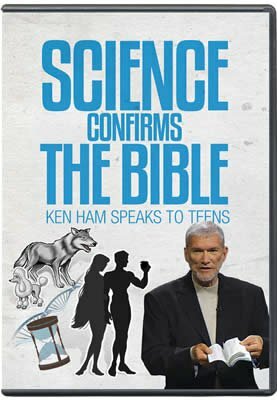 The topic may sound dry and technical to some, but the basic concepts are easy to understand and uncover valuable truths about human limits and our dependence on God’s Word to understand science properly. You’ll hear these terms repeatedly for the rest of your life (usually in defense of millions of years), so it helps to have a simple answer at hand. Let’s do some digging! Isn’t Radiometric Dating a Sure Thing? Most people assume that radiometric dating can find ages for almost anything. But that is not the case. It’s especially problematic for dating early human remains. Radiometric dating works only on radioactive rocks that appear to have decayed for a long time, such as certain lavas, but such rocks are not common (especially with human remains). To make matters worse, even if radioactive material is present, it must have produced sufficient by-products for accurate measurement. But the human evolution and migrations are too recent to be useful, if you accept evolutionary assumptions. Technically, there is one exception. The argon-argon method, as it’s called, can date rocks associated with recent human remains. It has even been used to successfully date the AD 79 eruption of Mount Vesuvius in Italy. However, it can only date volcanic rocks. It is very rare that stone tools, artifacts, or human bones are buried in lavas. In any case, lavas are so hot they destroy most of what they entomb. Another method occasionally used is called uranium-series dating. As uranium decays to lead, it passes through a series of other elements. Measuring the quantities of those elements enables us to estimate an age based on how far along the process has gone. For this method to work with human artifacts or bones, however, they need to be entombed in limestone containing uranium, such as that in cave deposits. That does happen occasionally, such as the Homo naledi bones recently found in the Rising Star Cave, South Africa. But it doesn’t help in most cases. Of course, radiocarbon can be used, and has been, to date human bones and artifacts if they still have organic carbon in them. However, secularists assume radiocarbon essentially disappears after 50,000–60,000 years, so they don’t even look for it among ancestors they believe lived over hundreds of thousands of years ago. So scientists have tried to identify alternative dating methods. Nevertheless, the same problems with traditional dating methods apply to the alternatives. 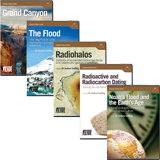 Let’s first review the problematic assumptions behind radiometric dating, and then we can understand how the common alternative methods have the same problems (and some unique problems of their own). We can reasonably reconstruct the conditions when the process started. The rate of change has stayed the same throughout the past. Nothing has happened to contaminate the process. An hourglass “clock” is a good analogy to help understand these assumptions (see below). 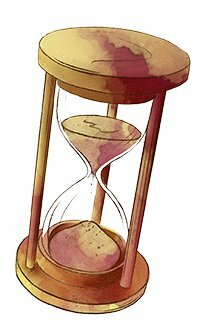 What if the funnel had a different size in the past, or the top compartment was not full at the beginning, or someone added sand after the clock started? An hourglass “clock” is a good analogy for understanding how all dating methods (not just radioactive decay) work using physical processes. They begin with three crucial assumptions. If the assumptions are wrong, then it doesn’t matter how accurate the measurements are—the conclusion will still be wrong. The original number of unstable atoms can be known. Scientists assume how many atoms appeared at the beginning based on how many parent and daughter atoms are left today. The rate of change was constant. Scientists assume that radioactive atoms have changed at the same rate throughout time, ignoring the impact of creation or changes during Noah's flood. The daughter atoms were all produced by radioactive decay. Scientists assume that no outside forces, such as flowing groundwater, contaminated the sample. These three assumptions can never be proved about rocks in the past. After all, who was there to continuously measure the rate to verify it stayed the same as today’s rate? Who witnessed the starting conditions? And who has continuously monitored the process to confirm that it was not contaminated? No one! No matter what dating method we choose, it is only as good as its assumptions. As Christians we know a trustworthy eyewitness to all of earth history—the One who created the earth, the universe, and man. Reliable eyewitnesses are needed. No matter what dating method we choose, it is only as good as its assumptions. As Christians we know a trustworthy eyewitness to all of earth history—the One who created the earth, the universe, and man. He alone knows the starting conditions and what has changed. The Creator reveals that, after creation, he judged man and the earth with a cataclysmic global flood. So, based on the absolute authority of God’s Word, we know that rates of earth processes did change in the past and haven’t been constant at today’s measured rates. A million-dollar, eight-year project involving six PhD creationists confirmed that radiometric decay rates must have been different in the past (search for “RATE Project” online). Let’s look briefly at the most common alternative methods secularists use to date human artifacts and bones. It needs to be emphasized at the outset that they rarely date the human artifacts and bones directly. Instead, they look at properties of the mineral grains making up the sediments in which the artifacts and bones are entombed. These are then assumed to provide the “age” of the artifacts or bones. It is discomforting to realize that we are continually being bombarded with low levels of radiation all around us. This radiation comes from the decay of potassium, uranium, and other elements in rocks and soils, in addition to cosmic rays from space. Luminescence dating is possible because this radiation increases the amount of energy stored inside certain minerals, almost like a rechargeable battery. Here’s how it works in theory. If a mineral is exposed to radiation for a time, it begins to accumulate energy as electrons get excited and move into defects in the crystal structures. The number of electrons keeps building and building. Assuming that the accumulation of energy has been constant through time, we can calculate how long it took for this amount of energy to build up. The energy in the “battery” resets to zero every time it is exposed to intense light, heat, or pressure. If we know the last time the mineral grain was exposed to light (or heat or pressure), we can calculate how long ago it was buried in the ground, safe from such exposure. Scientists can take samples of mineral grains from the sediment where human bones are buried. They will then expose these minerals to light or heat. This releases the accumulated trapped electrons, which emit photons of light. That is, they luminesce. This emission of light, stimulated by light or heat, is termed optically stimulated luminescence (OSL) and thermoluminescence (TL), respectively. The amount of luminescence indicates how long it has been since the last time the mineral was exposed to light or heat (see below). Luminescence dating is generally regarded by evolutionists as capable of dating from decades up to 2 million years ago. 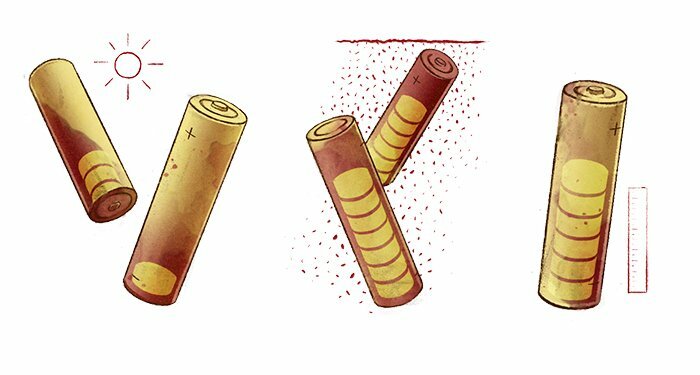 A rechargeable battery is a good analogy for understanding luminescence dating of mineral grains, which archaeologists use to date the sediments where they dig up human bones and artifacts that cannot be dated by other methods. When the grain was originally on the surface and exposed to light or heat, the rechargeable battery (the mineral grain) lost all the energy stored within the grain. The battery charge was “reset” to zero. When the battery (grain) was later buried with the bones and exposed to natural radiation, energy (a charge) then accumulated within the battery. In the laboratory, researchers zap the grain with light or heat to release the trapped charge and produce luminescence (photons). They then estimate how long it took for this energy to accumulate. Apart from the main three assumptions elaborated above, luminescence dating faces its own challenges. Do the minerals show when the fossil bone was buried, or did the minerals first get their stored energy somewhere else before being buried with the bone? Did the mineral grains, typically quartz or potassium-feldspar, have impurities that could have affected the rate of storage of electrons? Were these minerals totally reset to zero before being buried with the bone? There is another method measuring a property of electrons in minerals, called electron spin resonance (ESR). This method is similar to luminescence dating. It also involves measuring the abundance of trapped electrons in defects in the crystal structures of particular minerals. The difference is that this method measures how many electrons have an unusual “spin.” Let me explain. Electrons are often depicted as tiny spinning balls that act like magnets as they orbit the nucleus of each atom. Furthermore, electrons in the same orbit like to pair up, a negative spin with a positive spin. Paired electrons cancel out one another’s magnetic effects. However, as the atoms are exposed to environmental radiation, some electrons are knocked out of the paired relationships into defect trap sites in the mineral. These unpaired electrons generate a magnetic signal. In the laboratory, scientists can expose the mineral grains to a magnetic field, which makes the unpaired electrons spin like wobbling tops. The wobbling tops are then subjected to microwaves at the same frequency as their wobbling, causing them to resonate and so absorb the microwave energy. The changes in the microwaves’ intensity can be measured. Assuming no other effects are also occurring, scientists can determine the abundance of trapped electrons and how much radiation has bombarded the mineral since it was formed. Scientists have applied ESR dating to the quartz grains in sediments where human bones are found, as well as to calcite (lime) in limestone caves where bones are found. The method has also been directly applied to fossil teeth because teeth contain the mineral apatite (calcium phosphate), which can undergo this resonance. The ESR method is regarded as capable of dating from centuries up to at least 2 million years ago. Researchers have a third option at their disposal. Cosmic rays bombarding the earth from space produce rare radioactive particles called cosmogenic radioisotopes. Among these rare particles are radioactive beryllium-10 and aluminum-26. Both are produced in the atmosphere and thus fall to the earth’s surface in rain and in dry aerosols. So, these cosmogenic radioisotopes accumulate in surface sediments, and even in seafloor sediments. Cosmic rays also strike bare rock surfaces and can penetrate below the surface. So, beryllium-10 and aluminum-26 are also formed on rock surfaces, in the minerals they contain, and in soils and sediments. We know from measurements today the rates at which cosmic rays produce the beryllium-10 and aluminum-26 and how quickly thereafter these cosmogenic radioisotopes decay. We can then measure how much beryllium-10 and aluminum-26 are in sediment grains, seafloor sediments, rock faces, and even in ice cores. With all these measurements it is possible to calculate dates. Yet again, the three crucial assumptions elaborated above apply, as well as all the uncertainties about the processes involved in the cycling of these atoms due to weathering and groundwaters, and during erosion and sedimentation. Even evolutionary scientists recognize how unreliable and potentially untrustworthy these methods are. Two indicators stand out. First, they usually quote huge error margins, as much as ±35% of the quoted age. (This was the case with the dates for the Homo naledi bones.) Second, they usually apply more than one method to their samples. Only when there is some measure of agreement do they then report successful dates. These admissions of unreliability ignore the three unproveable assumptions that are crucial to all dating methods. So, no dating method can ever give us absolute dates that are certain. Even if every dating method yields the same date for the same rock, then at best the dating methods can only provide relative dates (one rock is older than another), not absolute dates (how much older one rock is, in real years). If the dating methods say 2 million years, it may actually be a hundred years or just ten years. To find absolute dates, we need to go to the only reliable eyewitness to all of earth’s history. In the Bible, he provides us with the earth’s birth certificate. God’s Word is true from the beginning ( Psalm 119:160 ). Since its author, the eternal Creator, is the truth, we know the earth is only about 6,000 years old. And we also know that mankind did not evolve over millions of years but was made at the very beginning by the Creator ( Genesis 1:26–27 ; Matthew 19:4 ). All of human history fits within this timeframe. When dating ape and human fossils, scientists prefer radiometric and radiocarbon dating. But many specimens fall in a “no man’s land” where those methods don’t work, so scientists must turn to alternative methods. The problem is that all these methods rely on assumptions about unobserved conditions in the past. Evolutionary scientists fill in these gaps with assumptions about slow decay rates and gradual change. 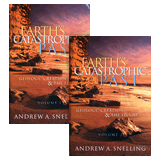 The Bible gives a very different picture of human history, however, including creation 6,000 years ago and cataclysmic changes brought on by Noah’s flood about 4,350 years ago. Scientists use radiometric dating methods (such as argon-argon or uranium series) if they find sufficient radioactive atoms in the volcanic ash or lava (or minerals in them) where a fossil is found. Sometimes fossil teeth have enough radioactive atoms to measure. Multiple lines of evidence show that radioactive elements decayed rapidly during and soon after the flood, so these “early” dates must be calibrated to the biblical timeframe—a matter of months, years, or decades, not millions of years. 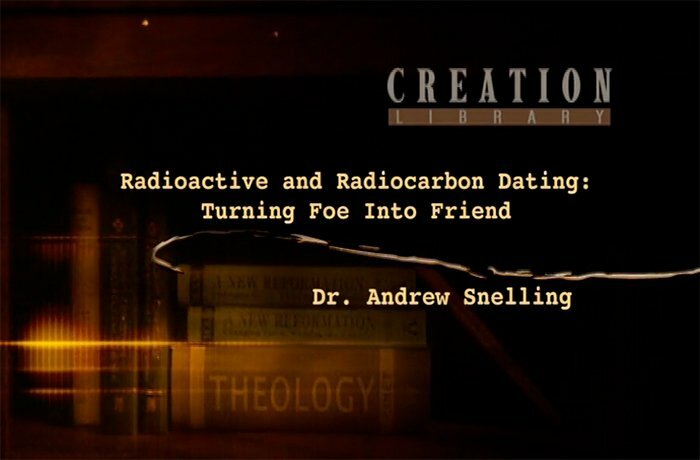 If scientists cannot find sufficient radioactive atoms to measure, they turn to alternative dating methods (luminescence, electron spin resonance, and cosmogenic radioisotopes). They must test mineral grains in the surrounding sediments (such as quartz or potassium-feldspar). Scientists measure the amount of energy, spin, or radioactive isotopes stored in these minerals. But they cannot be sure if they really started at zero or if impurities affected how much energy or radioisotopes the samples stored. Radiocarbon dating measures radiometric decay in organic (carbon) material in bones or wood. But to work, the specimens must contain measurable amounts of radiocarbon atoms, which is difficult because radiocarbon decays rapidly. Comparisons with historic dates show that radiocarbon dates are unreliable before 1000 BC because of a stronger magnetic field and rapid buildup of radiocarbon after Noah's flood. So earlier dates must be calibrated to the biblical timeframe.